Warehouse Management Systems are becoming popular as supply chain logistics become ever more complicated along with increasing customer demands. With an escalating volume of inventory movement, many organizations are turning to technology to streamline operations and meet these challenges. Seamless ERP to WMS Integration can help your company reach its supply chain operational goals. Advanced technology through Warehouse Management Systems (WMS) allow companies to respond to evolving market pressures and deliver on ever-shrinking time to delivery windows. These systems efficiently capture every scan, every movement of inventory and are designed to make both accuracies along with cost reduction a top priority. Improving the speed and accuracy of the fulfillment process and reducing the cost of labor are the key issues that distribution and warehouse-related businesses face. Gaining control over these issues requires technology that optimizes the utilization of your people and your assets–more than an automated data collection system that simply extends the paper processes leveraged from within some ERP System. 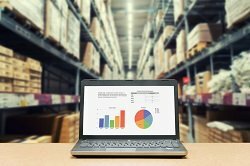 ERP systems typically have extensive financial and inventory control functionality, however, not enough capabilities when advanced warehouse demands are required. HighJump Warehouse Edge was built to empower you to automate your warehouse using tools like conveyers, carousels, sophisticated picking algorithms, advance replenishment methods, and order allocation, delivered in a simple, intuitive solution that can be implemented quickly and efficiently-providing your company the advanced warehousing inventory control functionality you need.